At this time of year I find it pretty much impossible to get out of the house on time in the mornings. It isn’t that there’s necessarily any more to do, but my morning routine includes opening up the polytunnel and right now it’s just too damned interesting to walk through without having a good look round. The summer crops are doing their thing, and it’s only natural to want to give them that extra little bit of attention to make sure that everything goes smoothly. Nixon on patrol for biscuits and rodents. But mostly biscuits. So – here I go, clad in my morning uniform*. Feed the Bleedin’ Cats, which necessitates gently punting Number Two Cat out of the way with one foot, as he is too stupid to realise that I cannot put food in his dish if his head is in it already. Whisk gracefully down the garden, resisting the urge to leap gleefully onto the last of the retreating slugs and snails. Check fruit cage for illegal immigrant thrushes. Lift chicken house door and observe birds parachuting out. Resolve, for the fifth time this week, to fix the chicken ladder this evening. Hang feeder out. Birds ignore it in the hope of… well, you’ll see. Fill two plant saucers with growers’ pellets (tastier and higher in calories than regular chook food) and attempt to climb over the chicken fence. Realise too late that I have not turned the power off, and get foot hopelessly caught in the fence in my haste to disengage myself from the wire. Stagger about cursing, but narrowly manage to avoid dropping the growers’ pellets this time. Chickens sigh in disappointment and get on with the regular food. Turn off power and renegotiate the fence. Lay saucers of growers’ pellets in adult-proof enclosure, and release the velociraptors. ** Resolve, for the fifth time this week, to get their new enclosure ready. Climb out of the run, hurling a scoop full of treat seeds over my shoulder to shake off the pursuit squad. Saw Indiana Jones do this with a crowd of Egyptian beggars once, and was highly impressed. Open polytunnel, tutting about my flabby end. *** Top up capillary bed reservoir. Head back for breakfast. Check the tunnel beds for moisture, spot-watering where necessary and keeping a weather eye out for pests and moulds. Tap sweetcorn to help with pollination. Make sure cucumbers, melons and watermelons are still securely wrapped around their support strings (they grow about 3cm a day at the moment). Tap tomato flowers and remove axial buds. Marvel at numbers of grass hoppers. Become momentarily obsessed with developing globe artichoke buds, and speak encouraging words to sweet peppers. Swear at chilli peppers, on the grounds that they should be as angry as possible. Catch sight of alarm clock on suspended shelf and gasp in horror. Am late again. Run to house, grab a quick shower and shave. **** Coffee in a hurry. Toast at the traffic lights. Vow, for the fifth time this week, to learn to delegate. *Manky gardening shoes, a bathrobe and a scowl. File that under ‘mental images I could do without’ and be grateful there’s no-one there to take photographs. **This year’s chicks are now quite large, and although their mother still roosts with them she has stopped looking out for them during the day. This means that they have had to take their place at the bottom of the pecking order. They manage to avoid getting in trouble by being highly manoeuvrable, beetling in and out of the adults at high speed like the Mini Coopers in the chase scene of The Italian Job. They also have no respect for the electric fence, relying on speed and surprise to squirt through the mesh between pulses – all so that they can eat the French bean plants. The little tinkers. ***Pleating the tunnel cover tightly round the door frame is tricky enough without your helpers sodding off and leaving you to it; next time things will be different, or my name’s not Horatio P. Fartwatering-Smythe. ****Shave optional. Oh, so optional. 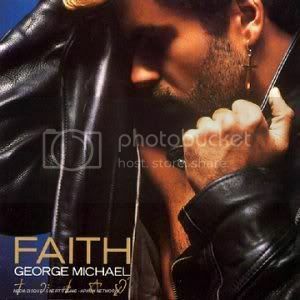 Thank you Mr George Michael, for making stubble socially acceptible. Did I forget my deodorant? If you enjoyed this post, please toss us a +1, a 'like', a stumble, or whatever you use. We love comments, and you can subscribe to the RSS feed to have future articles delivered to your feed reader.